Apparently, a lot of people (who aren’t me) went out and bought the new Lil Wayne record. NEW YORK (AP) “” Lil Wayne now has official numbers to back up his bragging “” the rapper’s new CD has sold a spectacular 1 million copies its first week. 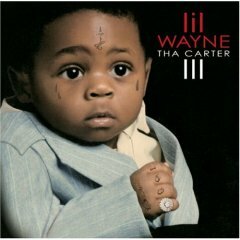 “Tha Carter III” is easily the best selling first week of the year, according to Nielsen SoundScan figures. Even Kanye West’s “The Graduation” didn’t eclipse that mark in its first week last year (though it was only about 50,000 copies short). In a slumping industry where selling 200,000 albums in one week is becoming a rare feat, Lil Wayne’s achievement is not only a triumph but a much-needed boost “” the last CD to sell 1 million or more in its first week was 50 Cent’s “The Massacre” in 2005.